— Thomas Jefferson in Notes on the State of Virginia, which appeared in the European Magazine and London Review in 1787. Almost from the time that the first Englishman set foot upon American soil, our language began to evolve. A continuous process throughout the centuries, “Americanisms” have been created or changed from other English terms to produce a language that differs from our forefathers, signifying our uniqueness and independence. By 1790 when the United States took its first census, there were four million Americans, 90% of whom were descendants of English colonists. This, of course, left no question that our official native language would be “English,” but it would not be the same as that spoken in Great Britain. By 1720, the English colonists began to notice that their language was quite different from that spoken in their Motherland. How did that come to be? The reasons are numerous, the most obvious being the sheer distance from England. Over the years, many words were borrowed from the Native Americans, as well as other immigrants from France, Germany, Spain, and other countries. Other words that became obsolete across the pond, continued to be utilized in the colonies. In other cases, words simply had to be created in order to explain the unfamiliar landscape, weather, animals, plants, and living conditions that these early pioneers encountered. The first “official” reference to the “American dialect” was made in 1756 by Samuel Johnson a year after he published his Dictionary of the English Language. Johnson’s coinage of the term “American dialect” was not meant to simply explain the differences, but rather, was intended as an insult. Years earlier, however; as early as 1735, the English were calling our language “barbarous,” and referred to our “Americanisms” as barbarisms. 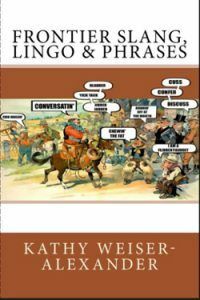 The English sneering at our language continued for more than a century after the Revolutionary War, as they laughed and condemned as unnecessary, hundreds of American terms and phrases. Our leaders, including Thomas Jefferson and Benjamin Rush, agreed — it was not only good politics, it was sensible. allow, guess, reckon, meaning to think. bureau, meaning a chest of drawers. Other words that were simply “created” included such terms as “groundhog,” an animal that didn’t exist in England; “lightning rod” for whiskey; “belittle,” coined by Thomas Jefferson in 1787; “bamboozle,” meaning to swindle, and hundreds of others. Bluff – Instead of using the British river “bank,” bluff began to be used in the South in the late 17th century and was the first word that was “officially” attacked as being a “barbarous” American term. Fork – Though continued to be used as a term for an eating utensil, Americans began to also use the term to mean a branch of a road or a river. Help – Americans began to refer to servants as help beginning around 1630. But, most atrocious to the English was the heavy use of contractions such as ain’t, can’t, don’t, and couldn’t. However, the feelings of the “rest of the world” mattered little to Americans as the language changed even more during the western movement as numerous Native American and Spanish words became an everyday part of our language. The official language of the State of Illinois shall be known hereafter as the “American” language and not as the “English” language. A similar bill was also introduced in the U.S. House of Representatives the same year but died in committee. Ironically, after centuries of forming our “own” language, the English and American versions are once again beginning to blend as movies, songs, electronics, and global traveling bring the two “languages” closer together. © Kathy Weiser/Legends of America, updated May 2017. 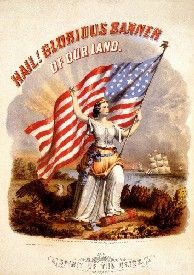 “Americanism” means a word or expression that originated in the United States. The term includes outright coinages and foreign borrowings which first became “English” in the United States, as well as older terms used in new senses first given them in American usage. — Milford M. Mathews in his preface to A Dictionary of Americanisms, 1951.